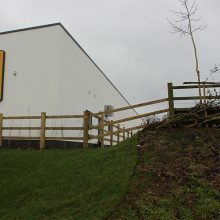 After successfully completing a handful of both refurbishment and new build stores throughout 2015 SUKR were selected to be part of Aldi’s 2016 UK Framework agreement. Our scope of works for these projects consists of installing up to 900 m2 per store of Wetherby’s latest lightweight external wall insulation systems (EWI) onto steel framed systems (SFS) and anti- crack render only silicone system, direct onto new block work. Being a Wetherby Recognised Contractor for the previous 10 years allows SUKR to provide the client with piece of mind that the works are being installed to the highest standard along with the ability to offer a joint materials and labour guarantee on completion. SUKR were appointed as Principal Contractor by Workman LLP to complete a variety of works at TK Maxx in Birkenhead. Site Management, H&S and scaffolding. Structural repairs to tie the rear and gable elevation using the Helifix Helibeam and CemTie systems. Removal of the existing defective render and application of a new lightweight Wetherby Silicone Render System. This included the application of theAspira Render Protector system which uses the latest Fluorocarbon Nano Technology to help protect the new render system from future staining and algal growth. Restoration of the existing Timber window cills. Concrete repairs to the concrete window pods and Silicone paint coatings. The entire project was successfully managed and completed within a 7 week programme which included working weekends to ensure SUKR met the clients requirements for a fast, efficient turnaround. This project also highlighted SUKR’s responsive ability to resolve unexpected problems that can crop up on projects by designing and installing Helifix structural works to the rear and gable, which only came to light upon removal of the existing render highlighting cracks to the main substrata. 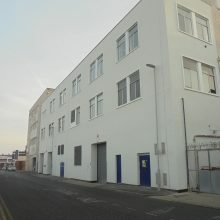 Both Workman LLP and TK Maxx were very happy with SUKR’s performance, attitude and standard of workmanship at every stage through to completion. Shropshire Towns and Rural Housing (STAR) are an ALMO looking after Shropshire Councils housing stock and appointed SUKR to remove a first generation EWI system that had cracked and failed over the last few years, and then install a new, lightweight EWI system with the latest detailing in the market. The failing of the existing system had led to the tenant having damp and condensation issues making for poor living conditions. An in-depth survey was then completed by Wetherby Building Systems LTD to check the suitability for a replacement EWI system. 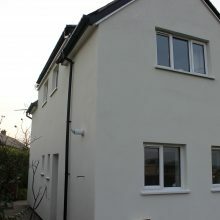 Removal and re-instatement of EWI systems. Enabling of all ventilation, flue upgrade and associated pipe work to ensure all latest regulations were met. The project was completed within a 3 week programme and delivered to a high standard for both STAR Housing and the tenant leaving a crisp, modern finish to the Non-Traditional property.